Membership rates are shown on the below table. Your initial payment must be paid by no later than Staurday 23rd Febrauray 2018, this includes your affiliation fee to Gibraltar Hockey and the European Hockey Federation (EHF). If Gibraltar Hockey does not receive your payment, you will not be eligible to play for a team. OUR NO PAY, NO PLAY WILL BE STRICTLY ADHERED TO (unless alternative payment options have been agreed with GH). 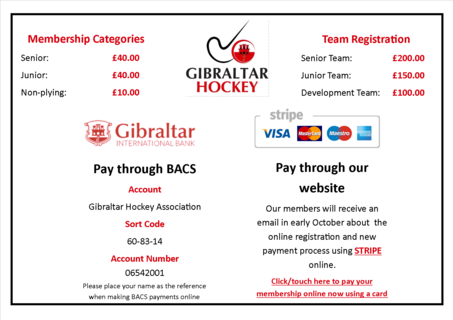 GH membership covers annual running costs of Gibraltar Hockey, all EHF affiliation fees. It also includes the provision of umpires, our own qualified hockey coaches, first aid kits, national representation, maintenance, hockey and goal keeping equipment. As the governing body we also promote and mentor players, alongside umpire and coaching development at all ages. If you have registered online, having 'members' website access then you will shortly be able to update your membership and pay electronically. Details will be sent out in and be included in your October 2017 statement. Have you re-registered for the 2017-2018 season? Check your emails for more details on updating your membership details and re-registering. 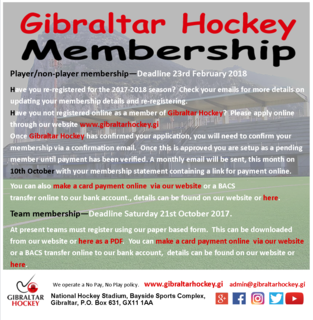 Once Gibraltar Hockey has confirmed your application, you will need to confirm your membership via a confirmation email. Once this is approved you are setup as a pending member until payment has been verified. A monthly email will be sent, this month on 10th October with your membership statement containing a link for payment online. transfer online to our bank account., details can be found on our website or here. Team membership—Deadline Saturday 21st October 2017. 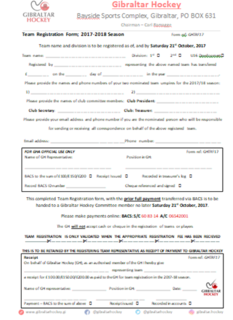 At present teams must register using our paper based form. This can be downloaded from our website or here as a PDF. You can make a card payment online via our website or a BACS transfer online to our bank account, details can be found on our website or here. Click on an image below to open/download a PDF copy.